The site is located in Lockleaze near the M32 and the historic parkland estate Stoke Park. The original square was built post war. The square is steep sloping and suffers from strong winds. Gainsborough square was originally a neglected green area with a single foot path which was poorly designed, meaning it was inaccessible to disabled users. This was a particular issue as there is sheltered accommodation for disabled adults nearby. Bristol City Council worked with the community to create a vison document which led to the regeneration plan for the square. To improve the public realm, new pathways were constructed across the square and the existing children’s play area and football pitch were extended. The original trees were maintained and 60 new trees were planted to shelter the square from the wind. 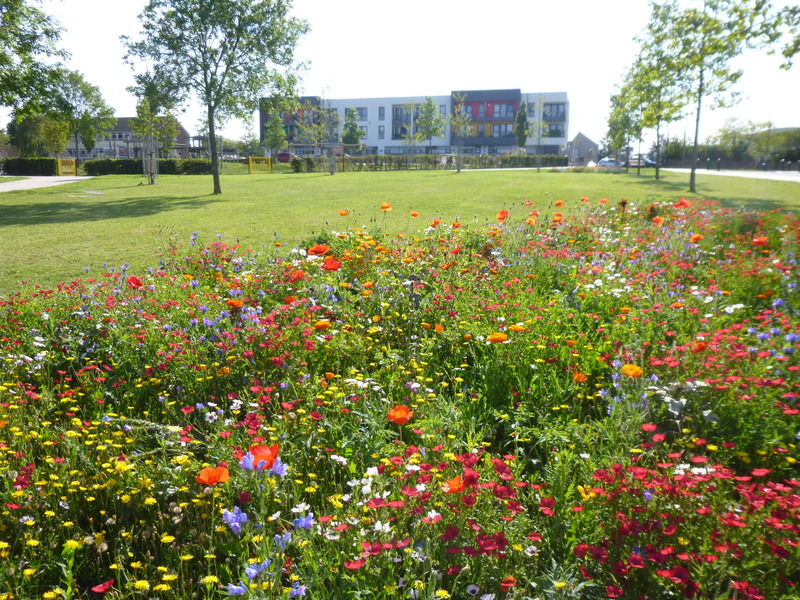 A new wildflower meadow was also created with 100,000 bulbs being planted and a food growing space was created within the square for community growing projects. The council worked with the local children to design a sheltered platform and seating area within the park, adjacent to the bus stop. To make the square wheelchair accessible, new wider and lower kerbs were created and barriers were removed. The one-way traffic flow around the square was retained to ensure safety for public. The rejuvenated square is maintained by the Highway Authority and the council’s parks maintenance team. Can be used in cities with neglected green spaces and a need to improve the public realm. It is important to keep engagement with stakeholders and communities throughout long term projects. Total cost was £2.5 million. Funding came from Bristol City Council and the LEP West of England Revolving Infrastructure Fund (RIF).